Debating replacing my Shield with the new 4K TV because of the apple ecosystem. My question is what is the current best practice of playing downloaded torrent .MKV files onto the new 4K Apple TV? Apple unveiled the long anticipated Apple TV 4K on Sep 22nd, a good companion to play movies and TV shows in amazing 4K HDR quality. Disappointingly, there is no move slated to MKV format, making it frustrating to play MKV on Apple TV 4K or earlier versions, despite the open-source Matroska is so far the most qualified HD/4K movie container format over the internet. MacX Video Converter Pro is your best aids you to convert MKV to Apple TV supported format like MP4, MOV, M4V with fast speed and high quality. No need to worry about format incompatibility issue. Supported iDevice:Apple TV 4K, iPhone (X/8/7) and iPad (Pro/Air) or lower. Solutions revolving around MKV playback on Apple TV aren't far to seek. To name a few, you can watch MKV files on Apple TV via Airplay mirroring or remux the MKV video file so as to be compatible with the Apple TV. But today we will focus on playing MKV on Apple TV via converting and explain why the workaround is superior to the other two. Airplay mirroring involves in mirroring your Mac display to the Apple TV. To be exact, you will need to have a modern Mac, with which you can play MKV with the aid of VLC or other MKV player like 5KPlayer, and then just mirror the screen to Apple TV. It helps to put an exact copy of the file into a new container, e.g. from MKV to MP4 that is supported by Apple TV. Remuxing with tools such as MKVToolNix doesn't touch the video and audio streams inside, so you can play MKV on Apple TV without converting thereafter. Converting is also known as transcoding or reencoding. To be specific, the MKV file will be reencoded into a new codec, bitrate, resolution or format that your Apple TV will accept, through which Apple TV will play the converted MKV files. 1. You can play MKV on Apple TV without converting instantly. 1. Fast MKV files copy. 2. No quality loss as remuxing leaves the streams untouched. 1. No problem to play MKV on Apple TV after the conversion. 1. Third-party MKV player like 5KPlayer or VLC or MKV codec is needed to play MKV on Mac as QuickTime doesn't support MKV format. 2. The same network is required to enable the mirroring. 3. Apple TV should be 2nd generation or later and Mac OS should be Mountain Lion or later. 1. Some audio or video stream in MKV file may be not accepted by Apple TV, for example, the MKV file contains a codec that Apple TV won't recognize. So simply remixing MKV to MP4, MOV or M4V doesn't help solve MKV playback error in Apple TV. 1. Some unnoticeable quality loss. Conclusion: Frankly, the three ways are defective. For instant playback, AirPlay wins. But if the truly successful MKV playback on Apple TV matters, converting is definitely worth a shot, since it solves the format issue once and for all, without the need of any third-party player, network or worrying about codec incompatibility problem. You can just transcode MKV to MP4, MOV, or M4V for Apple TV streaming with a MKV converter and then watch MKV on Apple TV effortlessly. Transcoding refers to quality degradation and lengthy video reencoding. But these aren't problems with MacX Video Converter Pro. Equipped with high-quality engine, deinterlacing, multi-core CPU, Hyper-threading and the latest Intel QSV acceleration tech, the MKV video converter triumphs over its competitors and successfully delivers the best possible output quality and fastest video conversion speed, up to 3-5X faster. It supports converting virtually all video formats, ranging from MKV, HEVC (H.265), MTS, AVI, WMV, FLV, VOB, WebM, 3GP, to MP4, MOV, M4V playable on Apple TV and other Apple devices. You will be amazed by its widest device support, thanks to its 350+ readymade profiles for Apple TV 4K, iPhone X, iPhone 8, iPad Pro, iMovie, PSP, Samsung Galaxy S8, to name a few. Just follow the stepsto convert MKV to Apple TV and then play MKV on Apple TV, including the latest 4K Apple TV. After running the video converter on your computer, click +Video button to load MKV file to be converted. Multiple videos are allowed to convert at a time. There are two options - either choose MP4, MOV, M4V format or directly choose the profile for Apple TV. Here we take the later one as an example. Just go to Apple -> Apple TV (MPEG4 or H.264). For higher output quality, H.264 is highly recommended. 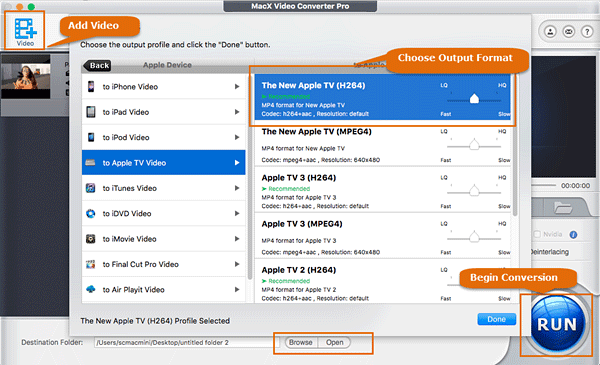 For faster conversion, you can choose Apple TV MPEG4 as the output format. Click Browse button to save the file in the destination folder and tap RUN to begin the conversion from MKV to Apple TV format. To play MKV on Apple TV, you can go to iTunes > Preference > choose Apple TV and then you can stream the MKV content to Apple TV with big widescreen TV. What is MKV - An open source multimedia container that holds an unlimited number of video, audio, picture, or subtitle tracks in one file, intended to store movies or TV shows. Apple TV - A digital media player and microconsole developed by Apple Inc, meant to receive digital content from a number of sources like iTunes store, Netflix, Hulu, SlingTV, YouTube, etc.